Earn up to 79,112 reward points. 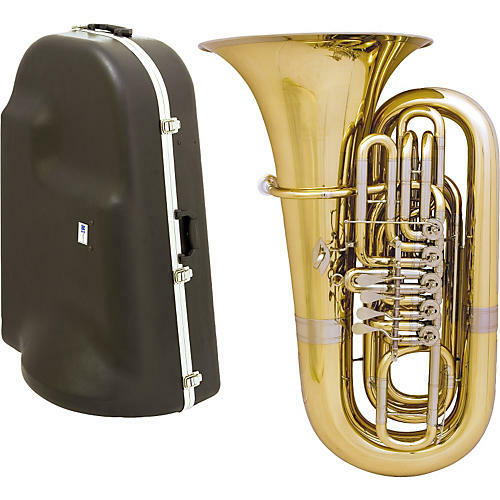 This package includes the Miraphone 191 Series 4-Valve BBb Tuba and a hardshell case. The Miraphone 191 Series 5/4 BBb Tuba is a solid instrument with a larger bell and bore that produces a big, dark sound, with minimal effort. The 191 features a .835-inch bore design for a quick response with excellent intonation, plus an 18.5 inch upright bell for outstanding resonance and projection. The Miraphone 191 is a compact instrument, designed to be easier to hold and carry. The features of this instrument are many. It has a large, dark sound that is very easy to produce. The large bell and bore make it easy to play with a big sound with little effort on the part of the player. For a piston valve model of this instrument please see the Miraphone 1291. Order a tuba with outstanding resonance and projection today!